Posted on Thursday, August 11th, 2011 at 10:30 am. 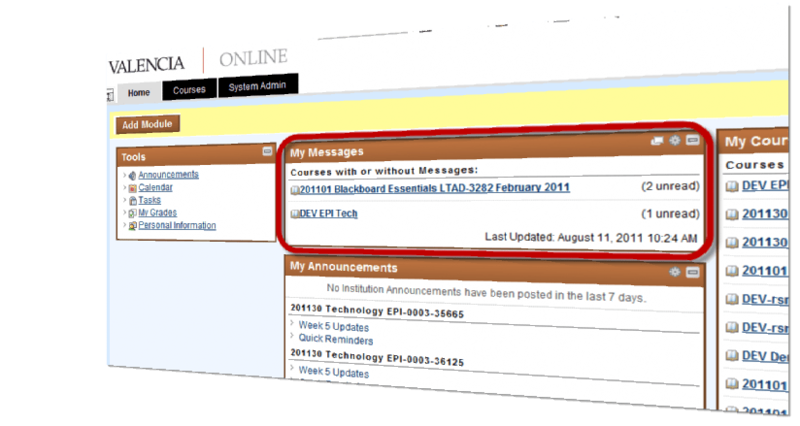 A frequent enhancement request for Blackboard Learn 9.1 by our faculty and many other faculty around the country is the ability to see if you have a message within a course without having to log into each course. This would be especially helpful for faculty teaching a large load of courses using Blackboard and utilizing its Message tool for internal private communication. Your requests has been answer with the installation of a new building block called My Messages. This new module finally gives you the ability to see any new messages in current courses on your own dashboard for Blackboard at Valencia and provides a direct link to the inbox within the appropriate course. This is available for all Blackboard users at Valencia; including faculty, staff, and students. The entire LTAD team would like say a big THANK YOU to Bruce Tenison from Wallace State who created this building block and assisted with some last minute modification needed before we could go live prior to the start of Fall semester! For other institutions interested in the My Messages building block it is available through OSELOT (Open Source Community for Educational Learning Objects and Tools) http://projects.oscelot.org/gf/project/wsccmymessages. I downloaded the Blackboard Mobile App for I-Pad but when I searched for Valencia (it came up as “Valencia COMMUNITY College”), it said we have a Blackboard version that “is not yet supported”! So the mobile app has no present value for me. Thanks – we will be solving this issue shortly.